Swimmers from GSAL scooped 28 gold medals at the English Schools’ Swimming Association (ESSA) north east division championships in Huddersfield. The 18 medal winners, aged from 11 to 17 years old, competed against 16 other school in medley and freestyle events. GSAL swimmers finished first in seven of the 12 relay races and second in another, picking up 28 gold and four silver medals. Three teams are now through to the national finals which will be held in Southampton on November 26. They will compete in the intermediate girls’ medley relay, the intermediate boys’ medley relay and the senior boys’ freestyle relay. Two other teams are first reserves for the junior boys’ medley and the intermediate boys’ freestyle relays. 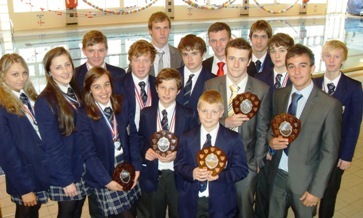 Fifteen of the 18 GSAL gold medal winners are photographed back (L-R) Sophie Taylor, Ellen White, Jonathan Harries, Gordon Benson, Angus Hall, Nathan Hale, Douglas Walker and Mats Crisp; middle (L-R) James Thompson, Will Stevenson, Kent Sampson and Max Emmott; front (L-R) James Coates and Jacob Butterfield.